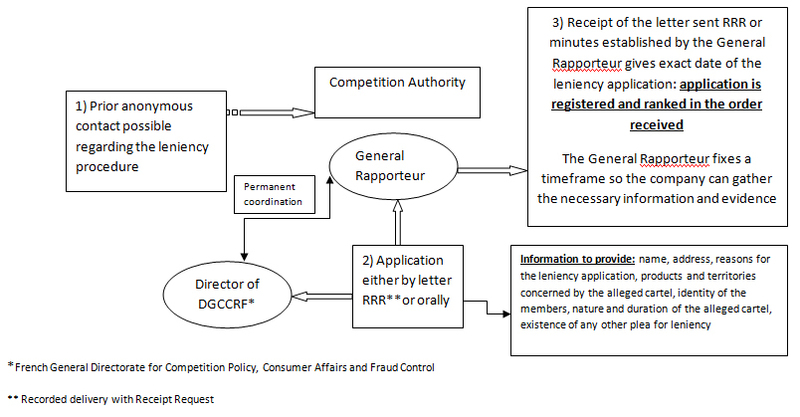 On March 2, 2009, the Competition Authority (formerly the Competition Council) issued a procedural notice regarding leniency program “à la française”, which is governed by Articles L.464-2 IV and R.464-5 of the French Commercial Code. Pursuant to Article L.464-2 IV, “immunity from any fine or a reduction of fines may be granted to a company or a body which has, with others, implemented a practice prohibited by the provisions of Article L.420-1 (Article 81 of the EC Treaty), if it has contributed to establish the existence and reality of the prohibited practice and to identify its perpetrators by providing information that the Authority or the Administration did not have beforehand (…)”. Introduced by the Law on New Economic Regulations (“NER”) dated May 15, 2001, the leniency program has been periodically improved, taking inspiration from, in particular, all the work of the European Competition Network (“ECN”). After all its efforts, on September 29, 2006, the ECN issued a leniency “model program”, which the competition authorities in member states belonging to the ECN undertook to implement to harmonize their respective policies and thereby render this program attractive to companies. The French leniency program, which conforms with that of the ECN model, provides a permanent framework in which companies, parties to cartels and concerted practices prohibited by Article L.420-1 of the French Commercial Code, are rewarded for their cooperation. Specifically, cartels between companies consisting of, in particular, price fixing, production or sale quotas and the sharing of markets, including during invitations to bid, or any other similar anti-competitive behavior between competitors, are considered prohibited agreements or practices. To date, the Competition Authority has rendered only four decisions on leniency cases but, the unanimous opinion is that the cases brought before them will increase within the next few years. 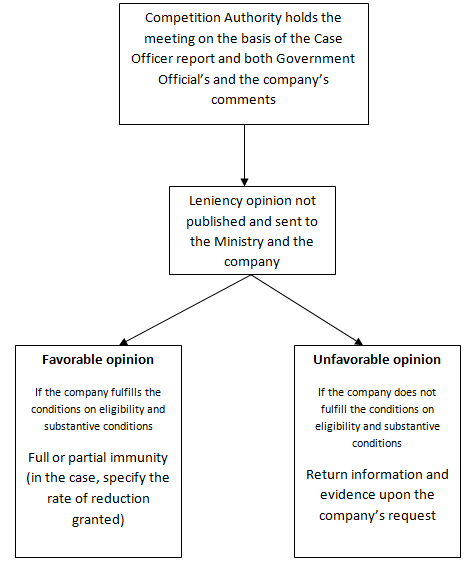 As the immunity or fine reduction is proportionate to the company’s contribution to proving the case, the eligibility conditions for immunity from or reduction of fines varies depending on the quantity and quality of the information that the “repentant” company may provide to the Authority on the alleged cartel. Please see the following table for details on the conditions of eligibility and substantive conditions that the company must meet to make a plea for leniency (I). Further, the plea for leniency is subject to a strict procedure before the Competition Authority (II). any documents in its possession that can identify the locations, dates, and purpose of the contacts or meetings between the cartel members. the company in question provides evidence that the alleged cartel exists, which represents significant added value (by its very nature and/or its level of detail) with respect to the evidence already in the Authority’s possession. To grant partial immunity, the Authority will also take into account when the application for leniency is made and the extent of the significant added value of the information provided. no other company has obtained complete type 1-A immunity for the alleged cartel. the company must not have destroyed or falsified evidence prior to filing the leniency application. 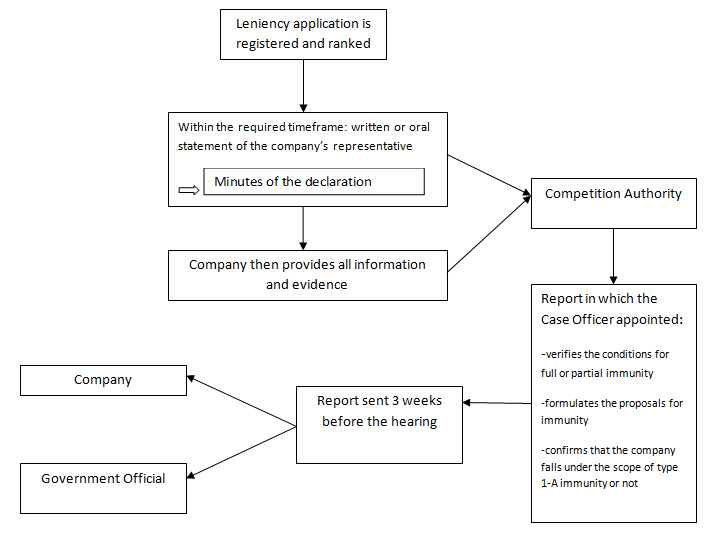 Immunity (even full) from fines granted by the Competition Authority does not protect the company receiving this leniency from any civil law consequences that may result from its participation in a cartel: a third party that considers itself a victim of the cartel or the illegal concerted practice in which the “repentant” company took part can always initiate legal proceedings against it claiming for damages for the harm suffered. The company cannot hide behind the immunity granted to escape from civil proceedings and damage awards. Faced with an illegal or allegedly illegal cartel, the Competition Authority may pass the case file on to the French State Prosecutor if it considers that the facts are likely to prove a criminal breach within the meaning of Article L.420-6 of the French Commercial Code. Pursuant to the aforementioned Article L.420-6, “an individual who fraudulently and personally played a decisive role in the conception, organization or implementation of the practices set forth in Articles L.420-1 [illegal cartels] and L.420-2 [abuse of a dominant position], shall be punished with four years’ imprisonment and a fine of 75,000 Euros”. There is a significant advantage to leniency: for individuals belonging to a company that received full or partial immunity from fines, leniency is one of the legitimate motives not to seek criminal prosecution against them under Article L.420-6. Decision 06-D-09 dated April 11, 2006 on practices implemented in the sector of door manufacturing, Decision 07-D-48 dated December 18, 2007 on practices implemented in the sector of national and international moves, Decision n°08-D-12 dated May 21, 2008 on practices implemented in the sector of plywood production, Decision n°08-D-32 dated December 1, 2008 on practices implemented in the sector in the iron and steel trade.